Room temperature bore systems give the user access to the magnetic field in an ambient condition environment. 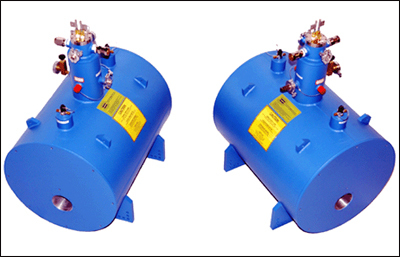 Such systems are useful when beams, temperature sensitive samples, vacuum chambers or furnaces must be placed in the bore. 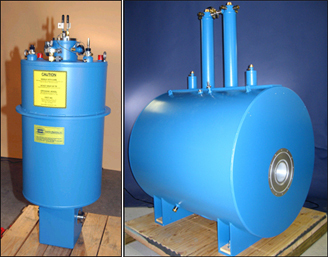 Systems containing smaller sized solenoids (to left) may have a rectangular tail section, horizontally mounted magnet bore and a larger liquid helium reservoir above the magnet. Systems with larger magnets and horizontal fields will often be provided like the units shown (below). Custom systems include use of magnets that are designed for minimizing stray fields (i.e., active- shielding).